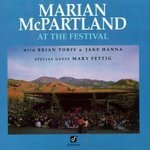 "At The Festival (CD)" by Marian McPartland, Jake Hanna et al. McPartland, Marian; Hanna, Jake; Torff, Brian Q.; and Fettig, Mary, "At The Festival (CD)" (1994). Visual & Performing Arts Faculty Music Gallery. 23.